Having painted those Squats for a so long time now, I felt that I really needed to paint something else! Fortunately noticed this little fella at my desk! simple conversion that was finished year ago but never got painted, ended up using the same colour scheme that I have used with my Squats. Easy, fast & very much fun! That is simply brilliant! Spot on Mikko! I love the feeling when you suddenly see 40k potential in unexpected direction! The scheme works equally well here as on the squats – great work. The conversion has some wonderful subtle details that sell the piece as a gritty futuristic figure. I particularly like the replaced stock on the rifle, and is that a little microphone bead I can see on the first shot? Man, I remember many years ago somebody made an amazing Hrud army out of Skaven models using the Eldar armylist (Migs might know the guy if I’m not mistaken). That was colonel Hammer. A genius and a good friend who sadly seems to have retired from mideling. yep. I should check if I can find them and do some kind of a memorandum to all the great work he did and inspired. Oh fantastic! Such a simple and elegant conversion. 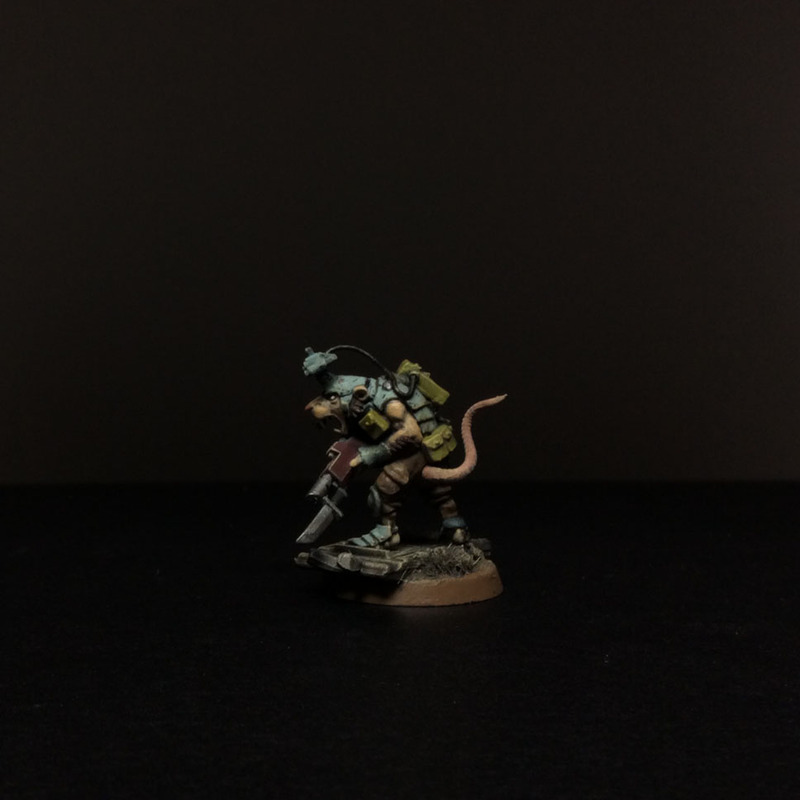 Seeing how well the Squat color scheme works here makes me think that you should make a unit of ratmen to use as allies with your Squats! Heretical i know, but it would make a certain sense that your clearly pragmatic and mining-focused Abhuman race would be willing to employ subterranean xenos. Nice Conversion and nice painting job. that’s a lovely conversion, GW missed the boat when they did 40k and neglected to add Skaven to the setting…..